Trying to Kick the Soda Habit? Here are Five Great Alternatives to Quench Your Thirst. | Gina Miller's Blog - A working mom's blog about fitness, travel, handbags & beauty. Water with produce - lemons, limes, oranges, berries, cucumber slices, mint, watermelon cubes, etc. The combinations are endless. My daughter loves fruit-infused water. Iced Tea - again, this is something that gives you endless options. I am in love with Kusmi tea that I picked up in Paris. I keep a few bags in my desk at work. I simply pour hot water over a teabag in a heat resistant cup and let it cool. You can actually get two or three uses out of one teabag. If you use good tea, you don't need sweetener. Double bonus: it brings back good memories of my trip to Paris. Sparkling water - Perrier makes some wonderful waters that are naturally flavored with lemon, lime and grapefruit. Whole Foods has a delicious mint sparkling water. My favorite is simple, unflavored Pellegrino. I enjoy squeezing lime into a big glass of it and adding some shredded mint for a virgin mojito-esque beverage. I buy Pellegrino by the case at Costco. Kombucha - this is a lower-calorie option you can pick up just about anywhere. 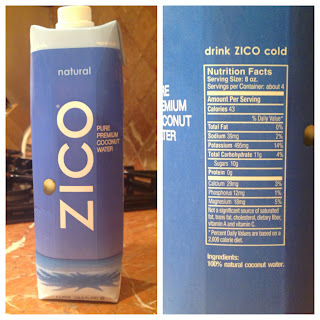 Coconut water - love this stuff on a hot day, particularly after a workout.